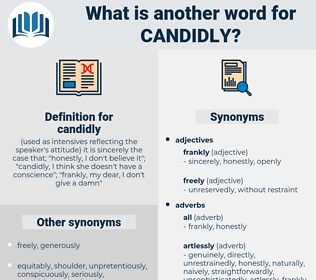 What is another word for candidly? 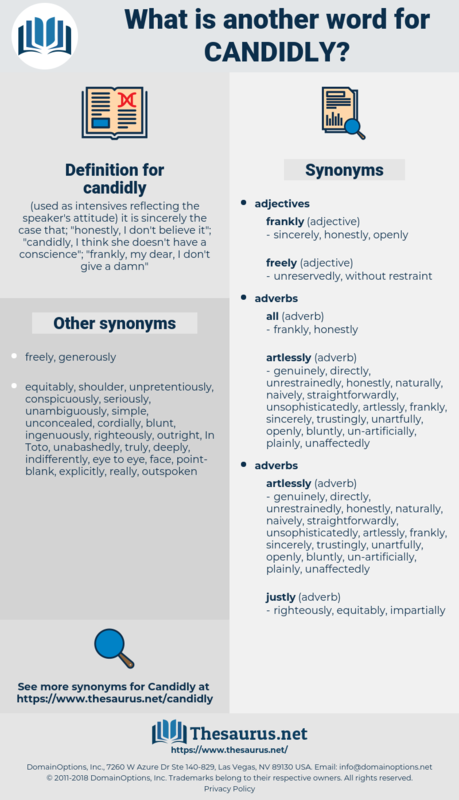 ( used as intensives reflecting the speaker's attitude) it is sincerely the case that; " honestly, I don't believe it"; " candidly, I think she doesn't have a conscience"; " frankly, my dear, I don't give a damn"
sincerely, truthfully, forthrightly, explicitly, bluntly, expressly, wholeheartedly, Overtly, transparently, heartily, boldly, really, freely, earnestly, genuinely, seriously, exactly, warmly, truly, squarely, cordially. Look at the matter simply and candidly. He related, truly and candidly, how he had forgotten his father, and nearly fallen into greater crimes, because he had been blinded by fortune, by empty greatness, and honour.